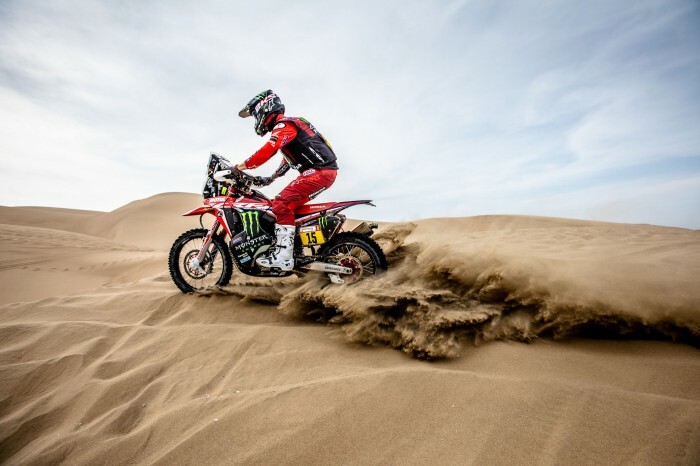 Monster Honda’s Ricky Brabec lost the overall Dakar 2019 lead to Pablo Quintanilla after he panicked he was running out of fuel. The American is now four minutes adrift of top spot but remains in the hunt and Quintanilla had to open today’s seventh day. “It was another tough stage. The temperature was nice but the wind was a big factor. It’s kind of hard to ride all day with the wind pushing you around. At one point for about 50 km I was concerned about fuel,” said Brabec. “I know that we had filled up at the top at kilometre 80 at the neutralization. I was freaking out because I ran out of one of my tanks earlier than expected. On the whole it was a good day. There’s four days left.